Ninety percent of a pine tree’s roots are in the top 3 feet of soil. 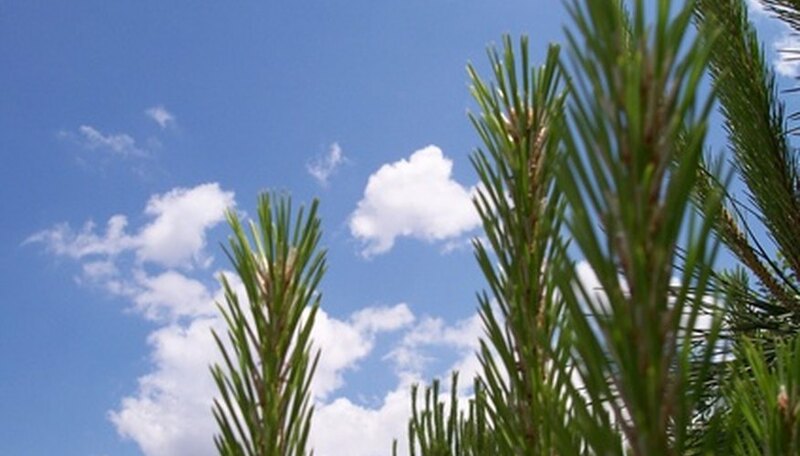 Despite this, removing small pine trees from your landscape can be a difficult prospect. Pine trees develop a tap root that can extend quite deep into the soil. Attempts to dig a pine tree out of the ground can lead to suckers, which are pine seedlings that spring from the roots of distressed pine trees. The best method to kill a small pine tree depends on its size. Measure the girth of a pine tree’s trunk with calipers to determine the best method to remove the tree. Mow down pine seedlings with trunks that are less than ½ inch wide. Frequent mowing will eventually kill pine tree seedlings. Cut down pine saplings with trunks smaller than 2 inches in diameter with branch loppers. Spray the cut tree trunks with a systemic herbicide containing glyphosate to kill the tree’s roots and prevent the re-emergence of sucker trees. Saw through tree trunks that are less than 5 inches in diameter with a saw. Spray the cut tree trunk with a systemic herbicide. Cut a V-shaped notch with an axe one-quarter of the way through the trunk of a pine tree with a 5-inch or larger diameter trunk. This notch should point in the direction that the pine tree will fall. Make a second cut horizontally straight through the trunk of the tree starting on the side opposite of the V notch and slightly higher than the point of the notch. Pull the axe free as the tree begins to fall. Spray the remaining tree stump with a systemic herbicide.